If ever any title deserved the description 'longawaited' it is this one. 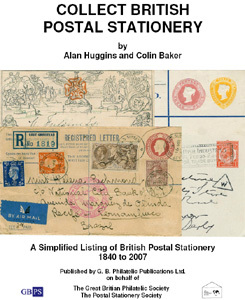 It is now almost forty years since the GBPS first published Alan Huggins magisterial handbook on British Postal Stationery, a model of synthesis of an exceedingly complicated field that for the first time brought all the knowledge about what I call 'stamps with large margins' in one place. Alan's book has been out of print for many years but copies remain keenly sought-after and obtain high prices on the market. In those four decades our knowledge of postal stationery has expanded enormously, there have been many new discoveries and as a collecting field it has become mainstream. Yet it is a testimony to Alan's contribution that his system of categorising and numbering postal stationery has been retained in this new book and it by far superior to the alternatives, as used, for example, in the Higgins and Gage catalogues. The first thing to say is that this is not a new edition of Alan's 1970 handbook: it is a totally new updated and simplified listing of all British postal stationery, official and stamped to order issued between 1840 and 2007 following the Huggins structure and numbering but omitting much of the specialist detail of the earlier title. You will still need your copy of 'old' Huggins if you want information on specimens, essays, die numbers, registration dates and a host of other facts, particularly for the Victorian era. This is a truly new book and one that is of utmost importance for all postal stationery collectors and indeed collectors of GB in general since very few GB collectors do not encounter and include stationery in their collections. Although it looks deceptively simple, the compilation and realisation of this catalogue has been a massive and time-consuming task. Alan has collaborated with a cowriter, Colin Baker, the secretary of the Postal Stationery Society and has called upon the combined knowledge and expertise of many members, including your reviewer, of both the publishing societies. In fact, this publication is a fine testimony to the power of collaboration in philately between the venerable and renowned cinquentenarian GBPS and the relatively newer but lively and go-ahead Postal Stationery Society, barely a decade old It is unlikely that this important publication would have been possible had the authors not been able to call on the resources of enthusiasm, knowledge, experience and support (and occasional nagging) of the members of both. As such it is a credit to both memberships. The most striking innovation is the use of colour printing throughout to illustrate the printed or embossed stamps and other details of postal stationery designs. This makes an enormous difference to the ease of the volume's use. It is particularly useful in the enlarged illustrations of die types but is helpful in all sections. For obvious reasons, when entires are illustrated they tend to be reduced reproductions which can limit their usefulness, but to keep the book's extent within reasonable bounds it is difficult to see how else the illustrations could have been handled. Nevertheless the overall impression is of clarity and the use of colour certainly adds to that. It is also enhanced by the choice of a clear sans-serif type and a largish fount for the type (a problem with the 'old' Huggins was its use of small type and a general cramped feeling in the layout). This is triumphantly avoided here and the listings are exceptionally easy to read, well laid-out and a joy to navigate. Overall, this makes the catalogue very approachable and thus, especially combined with the colour illustrations, very easy to locate and correctly identify items. After a brief introduction outlining the scope and extent of British postal stationery and the structure and system used, the catalogue is divided into nine major categories, envelopes, telegraph forms, postcards, newspaper wrapper and letter sheets, certificates of posting, registered etc. envelopes, letter cards and aerogrammes. Each major section is further subdivided into post office, stamped to order, official and forces issues and then in turn into reigns. For the first time, STO advertising rings receive a full-blown section of their own, which from their popularity and importance, they surely deserve. Christmas and commemorative aerogrammes get their first full listing and the coverage is right up to date, including the Scout centenary jamboree postcards issued (if you can call it that considering how difficult they were to locate) in summer 2007. An enormous amount of new information is here, both discoveries since the 'old' Huggins and material issued since. It is salutary to recall that the original book was published prior to the introduction of decimal currency. For many collectors, the range and complexity of recent post office issues will come as a revelation. 'Fish and chip' plastic packs, Welsh guaranteed delivery or 'post a book' jiffy bags may not yet be widely collected but I think this listing will spark interest. Already some recent items are very rare and with the post office reducing its postal stationery range and its apparent inability to distribute many items (or even know that it has issued them) means that a savvy collector will be able with the aid of this book to put together a collection of modem rarities cheaply if not easily. The clarity and simplicity of the listings is the book's chief joy. Postal Stationery is always going to be complex but previous listings ('old' Huggins included and especially Higgins and Gage) were never particularly easy to follow and were confusing to use to identify items correctly and structure a collection logically. I am currently organising my King George VI collection and I must confess that certain sections of that highly complicated reign had left me baffled. Now I sailed through the registration envelopes which previously had defeated me (and discovered that I was the proud and unsuspecting owner of several rare types) with the aid. of the listing here. Elsewhere, the listing of compound stamped to order items, official letter sheets, and newspaper wrappers will bring a smile rather than tears of frustration to the collector's face, be they debutant or old hand. The listing is priced throughout and initially the prices will cause many to whistle but I believe that pricing is if anything conservative. Many postal stationery items are great rarities which if they were conventional stamps would be much more expensive than the prices quoted here. After all a two penny Mulready (here £175 mint) is in effect a mint 1840 two penny blue. Nevertheless, some prices will cause debate not least among dealers. Many collectors will be glad to have bought their key items under the price regime of the 'old' Huggins. Few Telegraph forms are quoted at under £50 and many are up to £250 which as a collector of this material I can confirm reflects their scarcity if not their market value (I'm delighted to say) when I bought them. The prices also indicate the real rarity of some unconsidered and relatively recent item. The George VI penny half Penny reply card at £150 mint may surprise you until you try to find one. A lot of material issued in the last two decades have no prices given because they just don't appear on the market so will be a challenge to price when they do turn up. Remember too that the prices given here are for mint and 'plain vanilla' used. One of the joys of postal stationery collecting is that used items are often uprated with desirable adhesives or bear worthwhile postal history and postmarks which add to their value. At long last, this listing will give a guide to base values. Overall, this book is a triumph for which the authors and sponsoring societies deserve thanks and congratulations. It is well produced and printed with hardly any typos. It is strongly bound, printed on good matt paper with no show through and Pardys, surely the doyens of philatelic printers and worthy successors to Woods of Perth who printed the 'old Huggins', deserve an accolade for their careful manufacture. If one were to make suggestions for the future (for surely we will not have to wait another four decades for a new edition) the authors might consider including listings of postal orders and reply coupons (these exist elsewhere but gathering them here would be an enhancement since many stationery collectors include them) and perhaps a CD ROM or DVD could be produced showing the items illustrated complete and full-size, and perhaps also include examples of uprated and interesting usages. It's here so buy it now!